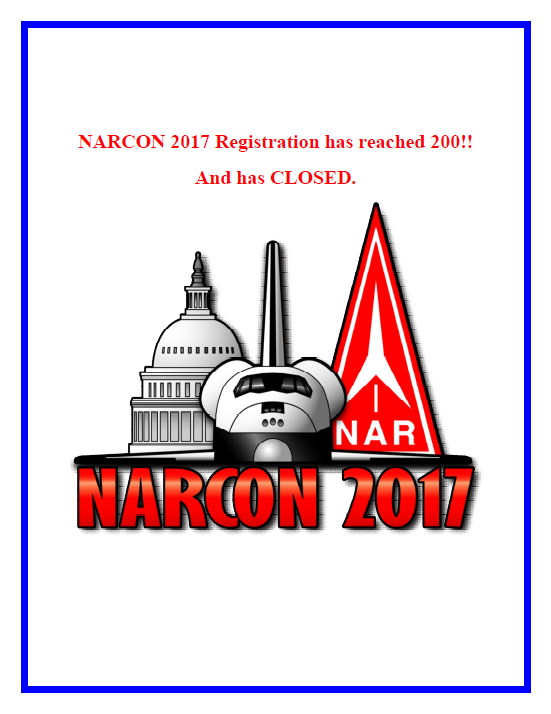 NARCON 2017 Registration has reached 200!! And has CLOSED. Walk-in Registration will not be accepted. Click the “Register for NARCON-2017” button at the right and you will be taken into the registration site. Start with the “NARCON-2017 Registration” item, clicking it will open the registration page. Do not create an account (the “My Account” tab). The “Home” and “Shop” tabs go to the same place a display all the conference’s registration items. Pick and complete the items you want. They can be viewed in the “Cart” tab. When done, click the “Checkout” and follow the instructions. This site is using the NAR’s PayPal account to process credit and debit cards. A fee will not be charged to either the NAR or the registrant. All attendees must register, either online or through the downloadable paper mail-in form, downloadable at the right. Advance registration will be available until Friday, February 17, 2017 or until we hit 200 registrations, whichever comes first. Banquet dinner tickets must be purchased by February 17. Sweatshirts Orders ENDED on January 22. The Event Rate for rooms at the Crown Plaza ENDED on February 2. The Aurora Flight Sciences Tour sign-up has CLOSED, we have reached the tour size limit. The Udvar Hazy Docent Tour sign-up has CLOSED. the tour group limit has been reached. After February 17, walk-up registration will be accepted at the event if we are still under our capacity limit of 200, but there will be a late fee of an additional $5 for the convention itself and it will not be possible to buy tickets for the banquet and speaker event. Because this event is proving to be so popular, do not count on being able to do a walk-up registration; we may be full by then as we can only accommodate 200. Please register online in advance. Students in teams that are registered for TARC 2017 may attend at no cost (the $5 fee will be refunded at registration check-in), but will have to pay for the banquet if they wish to attend. If you have questions that this website does not answer, please contact the Conference Director, Trip Barber, at <ahbarber@alum.mit.edu>.